Up until two days ago, I didn't own a crackle or shatter polish... and I still don't. No, I have a 'Mosaic' one. Seriously why can't nail polish companies stick with a consistent name for these sorts of polishes? Anyway, this is the new Ozotic Mosiac polish, which for all intents and purposes (man I love using cliches - I might just have to pull a few more of them out of my hat) sorry where was I, oh yes, it works the same way as China Glaze Crackle, OPI Shatter, BarryM Instant Nail Effects etc. So here are my baby gaga nails with mosaic on top. 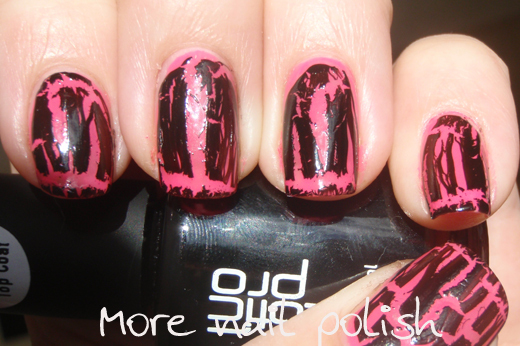 Application was a piece of cake and these crackle polishes are kinda fun to play around with. Then, waiting with baited breath to see what effect it will create when it crackles. Below is another quick mani I did as soon as my polish arrived in the mail. Initially, I was a little disappointed with the crackling effect, but then I did some reading about crackle polishes (specifically this post from the lacquerista) and realised I should have waited longer for the base to dry. I've only used this crackle polish twice, but both times I had that crack line just below the tip of my nail, on every nail. Interesting. I think my thumb was the driest in the picture below and cracked to my liking the best. So, while its a case of seen one, seen them all, I'm pretty happy with my Ozotic Mosaic and don't feel the need to try any other brand. You can buy ozoitc mosaic from a number of etailers, with prices ranging from $5.95 - $12.95. Just Google 'ozotic mosaic' and you'll find them. Although I think only piCture pOlish ship internationally. On another note, I was looking at the Artform website the other day and noticed that they no longer list their private label holographic or multichrome polishes. I guess you girls bought them all out! I also read on the Makeup Ally Nail board, a few girls ordered a polish from Artform and had an Ozotic Pro delivered. I guess I was right in saying their polishes were exact dupes of each other (using the same numbers etc), or more accurately, that the Artform polishes were a private label produced by Lumineye, whose proprietary brand is Oztoic. Looks like Artform will be supplying Ozotics to Aussies soon, and I think their prices will be a little better than piCture pOlish too. Oh and sorry, I can't help it. Must. Use. More. Cliches. It's so crazy how there were no crackle polishes (at least that I knew of!) for so long, and now it seems like every brand has just released them again in the last couple months. Now if everyone did that with the duochromes of the past... I'd be very poor! That first one is SOO COOL! Can't wait to try it out! I love the way crackle looks with two colours underneath! The day I looked "very nice"
Ozotic Elytra 528 over Ozotic 505.